Alzheimer‘s is a progressive disease, where dementia symptoms gradually worsen over a number of years. In its early stages, memory loss is mild, but with late-stage Alzheimer’s, individuals lose the ability to carry on a conversation and respond to their environment. In the later stages of Alzheimer’s disease, many people lose interest in food. You may begin to notice some changes in how or when the person eats. He or she may not be aware of mealtimes, know when he or she has had enough food, remember to cook, or eat enough different kinds of foods. This means the person may not be getting the foods or vitamins and mineralsneeded to stay healthy. Make sure the person’s dentures are tight fitting. Loose dentures or dentures with bumps or cracks may cause choking or pain, making it hard to eat. Take poorly fitting dentures out until the person can get dentures that fit. Try to use healthy fats in cooking, such as olive oil. Also, use extra cooking oil, butter, and mayonnaise to cook and prepare food if the person needs more calories. If the person has heart disease, check with the doctor about how much and what kinds of fat to uElimination diet pointers before you startse. Have the person take a multivitamin—a tablet, capsule, powder, liquid, or injection that adds vitamins, minerals, and other important things to a person’s diet. Serve bigger portions at breakfast because it’s the first meal of the day. 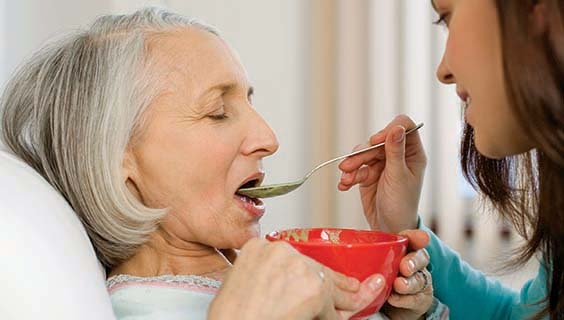 As Alzheimer’s disease progresses to later stages, the person may no longer be able to chew and swallow easily. This is a serious problem. If the person chokes on each bite of food, there is a chance that the food could go into the lungs. This can cause pneumonia, which can lead to death. Don’t use a straw; it may cause more swallowing problems. Instead, have the person drink small sips from a cup. Don’t give the person thin liquids, such as coffee, tea, water, or broth, because they are hardest to swallow. You can buy Thick-It® at most pharmacies. You add Thick-It® to liquids to make them thicker. You also can use ice cream and sherbet to thicken liquids. Don’t hurry the person. He or she needs time to chew and swallow each mouthful before taking another bite. Don’t feed a person who is drowsy or lying down. He or she should be in an upright, sitting position during the meal and for at least 20 minutes after the meal. Stroke (gently) the person’s neck in a downward motion and say “swallow” to remind him or her to swallow. Find out if the person’s pills can be crushed or taken in liquid form. Helping the person with Alzheimer’s eat can be exhausting. Planning meals ahead and having the food ready can make this task a little easier for you. Also, remember that people with Alzheimer’s disease may not eat much at certain times and then feel more like eating at other times. It helps to make mealtime as pleasant and enjoyable as possible. But, no matter how well you plan, the person may not be hungry when you’re ready to serve food.